A message from the editor of the indispensable Clean Air and Containment Review journal, about the latest issue. Clean Air and Containment Review has entered its fourth year! CACR13 is now out featuring updates on the ISO 14644 series of standards and much else. For more information or to subscribe please visit CACR or contact John Neiger via LinkedIn and request the Contents and Abstracts. CACR is a quarterly technical journal supported by subscribers and advertisers and it is my intention to keep it technical rather than commercial. Most articles are commissioned by me, but if you would like to write an article on any aspect of cleanroom or containment technology I would be very pleased to hear from you. Whilst writing can I also tell you about a new book that is coming out very shortly. It is called Cleanroom Management in Pharmaceuticals and Healthcare, edited by Tim Sandle and Madhu Raju Saghee. I was involved in chapter 9: Fundamentals of pharmaceutical isolators. For more information or to order please contact the publisher. There is a very interesting pre-publication offer! An international study has revealed that a new strain of the MRSA has made a leap from food animals to humans. Scientists from 20 institutions have conducted a research project focusing on the MRSA CC398 strain, known as pig MRSA or livestock-associated MRSA due to its prevalence among farm workers. The study was led by Translational Genomics Research Institute (TGen). Whole genome sequencing has shown that it was most likely an antibiotic-susceptible strain in humans in the past before transferring to food animals, where it became resistant to tetracycline and methicillin due to routine antibiotic use among animals to prevent staph infections. This excessive application of antibiotics has caused the disease to rapidly evolve and spread back to humans. The research was published in PLoS on-line and was titled “Persistence of Livestock Associated MRSA CC398 in Humans Is Dependent on Intensity of Animal Contact”. This day at the end of February marks the sixth international Rare Disease Day. On and around this day hundreds of patient organisations from more than 60 countries and regions worldwide are planning awareness-raising activities converging around the slogan “Rare Disorders Without Borders”. Activities will take place across Europe, all the way to Russia, continuing to China and Japan, in the US and Canada, and as far as Australia and New Zealand. The IEST has revised its standard for Product Cleanliness Levels – Applications, Requirements, and Determination. This standard provides methods for specifying and determining product cleanliness levels for contamination-critical products. The emphasis is on contaminants that can impact product performance. The requirements set forth in this standard are not required for all products but are intended for use in procurement and design contracts for those items where contamination control limits for parts, components, or fluids are necessary to ensure reliability and performance. This standard provides mutually agreed-upon limits for defining significant surface cleanliness and liquid cleanliness with respect to particles and molecular residue. The standard has been modified to include alternative cleanliness level designations that are better suited to accommodate user-specific applications. These modifications are included in informative annexes at the end of the document. For further details see IEST. A book of interest has been published on biofilms, the book is titled “Microbial Biofilms: Current Research and Applications”. “Biofilms are the default mode-of-life for many bacterial species. The three-dimensional structure of the biofilm provides the associated microbial communities with additional protection from predation, toxic substances and physical perturbation. 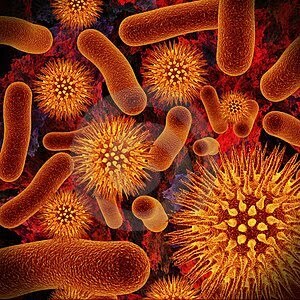 The variety of microniches provided by the biofilm also promotes a huge diversity of microbial life and metabolic potential. These complex and highly structured communities help to maintain the health of soils and waters. Current applications of biofilms include the degradation of toxic substances in soil and water, the commercial production of chemicals, and the generation of electricity. However, biofilm-based infections cause harm to millions of humans annually. In addition, biofilms can affect the quality and yield of crops and cause biofouling and microbially-induced corrosion. In this book, leading scientists provide an up-to-date review of the latest scientific research on these fascinating microbial communities and predict future trends and growth areas in biofilm-related research. Publication date: February 2012 Available now! Diphtheria is a serious disease caused by a toxin made by a type of bacteria known as Corynebacterium diphtheria. The toxin alters protein function in people with the condition. 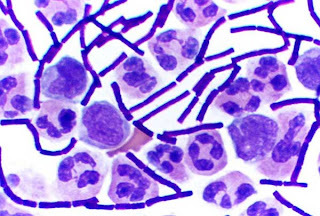 Currently there are several subspecies of the Gram positive bacteria recognized by scientists. Respiratory diphtheria manifests as a sore throat with low-grade fever and an adherent pseudomembrane of the tonsils, pharynx, or nose. Another form of the disease is known as cutaneous diphtheria. People with this condition have infected skin lesions which typically lack a characteristic appearance. On this subject, the IAQ Video Network and Cochrane & Associates have announced the release of another online video to help educate the public about issues that may impact their health. Their latest educational video discusses Corynebacterium diphtheria and diphtheria. The European Commission has announced it will launch an observatory to map progress and impact of the development of the EU's bioeconomy. The observatory, which is part of the EC's bioeconomy action plan, will gather data to follow the evolution of markets, to map EU, national and regional bioeconomy policies, research and innovation capacities, and the scale of related public and private investments. The Commission's in-house science service JRC will run the new resource. The observatory will start its 3-year term in March 2013 with the aim of making the data it will collect publicly available through a dedicated web portal in 2014. In this way, the observatory will support the regional and national bioeconomy strategies now being developed by EU Member States. The observatory will track a number of performance measures, including economic and employment indicators, innovation indicators, and measures of productivity, social wellbeing and environmental quality. The EU-project PharmaSea will bring researchers to some of the deepest, coldest and hottest places on the planet in the hunt for novel antibiotics. Marine organisms that live more than 6,000 meters below the sea level are considered to be an interesting source of novel bioactive compounds as they survive under extreme conditions. Scientists from the UK, Belgium, Norway, Spain, Ireland, Germany, Italy, Switzerland and Denmark will work together to collect and screen samples of mud and sediment from huge, previously untapped, oceanic trenches. The large-scale, four-year project is backed by more than €9.5 million of EU funding and brings together 24 partners from 14 countries from industry, academia and non-profit organisations. The PharmaSea project focuses on biodiscovery research and the development and commercialisation of new bioactive compounds from marine organisms, including deep-sea sponges and bacteria, to evaluate their potential as novel drug leads or ingredients for nutrition or cosmetic applications. The FDA has updated their list of FDA related acronyms and abbreviations. Microorganisms found in pharmaceutical and healthcare environments require identification in order to determine the species. This is important so that the origin of contamination can be assessed and the origin of contamination determined. This is commonly performed by using a standing technique called the Gram stain, which is based is a type of "phenotypic identification method" and it undertaken so that the microbiologist can understand the general profile for microorganisms. Cellular staining provides important information relating to the composition of the microbial cell wall, as well as the shape of the organism. Of these, the most frequently used method is the Gram stain. The Gram stain method employed includes the four-step technique: Crystal violet (primary stain); iodine (mordant); alcohol (decolorizer); and safranin (counter stain). Done correctly, Gram-positive organisms retain the crystal violet stain and appear blue; Gram negative organisms lose the crystal violet stain and contain only the counter-stain safranin and thus appear red. Common pitfalls in this method are that heat fixation may cause Gram-positive cells to stain Gram-negative and older cultures may give Gram-variable reaction; using too much decolorizer could result in a false Gram-negative result and not using enough decolorizer may yield a false Gram-positive result. The Gram reaction is based on the differences in the cell wall composition for the two cellular 'groups'. The bacteria that retained the stain (the Gram-positive bacteria) have a higher peptidoglycan and lower lipid content than those that do not retain the stain (the Gram-negative bacteria). The effect of the solvent is to dissolve the lipid layer in the cell wall of the Gram-negative bacteria, thereby causing the crystal violet to leach out; whereas for Gram-positive bacteria the solvent dehydrates the thicker cell walls, blocking any diffusion of the violet-iodine complex, which closes the pores of the cell and retains the stain. 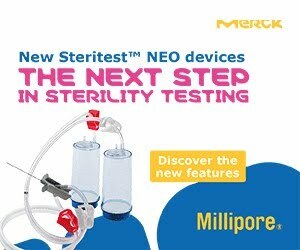 There are now several automated Gram stain devices available on the market that can reduce the labour requirement required when performing several multiple Gram stains and, possibly, improve accuracy. 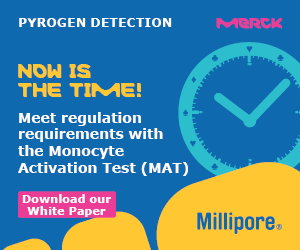 The issue of beta-glucans and the relationship of these substances to the LAL test remains an important area not described in great detail in compendial or regulatory documents. β-Glucans (beta-glucans) are polysaccharides of D-glucose monomers linked by β-glycosidic bonds. Glucans are important because they can react with certain lysates and cause interference with the LAL test. In relation to this area of pharmaceutical concern, Tim Sandle has written an introductory paper. It can be accessed here: glucans. Cleanrooms are highly controlled environments where the air quality is monitored to ensure the extreme standards of cleanliness required for the manufacture of pharmaceutical, electronic, and healthcare goods. These stringent standards usually require high fresh air rates, extensive filtering, temperature, and humidity control - all of which results in increased energy usage. Protection from uncontrolled ingress of external ambient air is achieved by creating a pressure differential between the cleanroom and its surroundings. Contamination control is the primary consideration in cleanroom design; however, the relationships between contamination control and airflow are not well understood. Contaminants such as particles or microbes are primarily introduced to cleanrooms by people, although processes in cleanrooms may also introduce contamination. During periods of inactivity or when people are not present, it is possible to reduce airflow and maintain cleanliness conditions. In relation to the risk assessment of cleanrooms, Tim Sandle has written a free-to-view online paper. Access it here: Sandle cleanrooms. Electron beam processing, commonly referred to as e-beam, is a sterilisation method which uses high energy electrons to sterilise an object. In terms of sterilisation technology, it is a method of irradiation and is sometimes described as electron irradiation - the act of applying radiation, or radiant energy, to some material. As an introduction to the subject, Tim Sandle has written an article for the journal European Medical Hygiene. For details, please see EMH or contact Tim Sandle for further details. Follow this link to download the extensive 2012 WHO report on tuberculosis. A comprehensive and up-to-date assessment of the TB epidemic and progress in implementing and ﬁnancing TB prevention, care and control at global, regional and country levels using data reported by 204 countries and territories that account for over 99% of the world’s TB cases. Thanks to catchthemicrobe for the news. On 1 April 2013 the National Institute for Biological Standards and Control (NIBSC), currently a centre of the Health Protection Agency (HPA), will join the UK Medicines and Healthcare products Regulatory Agency (MHRA). The two organisations already work closely together and have common interests in managing risks associated with biological medicines, facilitating development of new ones safely and effectively, and maintaining UK expertise in this area. All other divisions of the Health Protection Agency will transfer to a new body, Public Health England (PHE), on 1 April 2013. NIBSC and its staff will continue to operate as normal from the present site at South Mimms in Hertfordshire, and NIBSC will continue to use business systems currently hosted by the HPA, though they will now be owned and operated by PHE. For further details, see MHRA. The primary risk to the immunocompromised patient arises from nosocomial infections (or hospital acquired infections). A risk to patients additionally can arise from administered medicines. Until the late 1990s the primary risk was generally regarded as arising from bacteria. 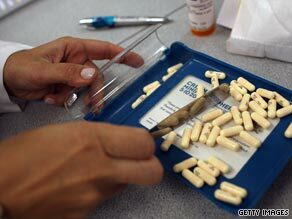 However, since 2001 the second most common recall for pharmaceutical medicines has been due to fungal contamination. Moulds are ubiquitous in nature and, therefore they pose a risk to pharmaceutical manufacturing operations. 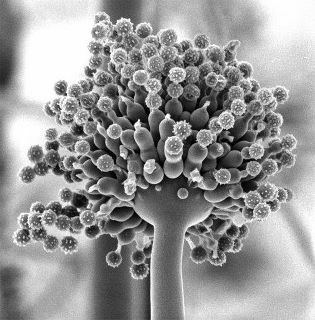 Aspergillus spp., Penicillium spp., Trychophyton spp., and other filamentous fungi have, in some cases, caused significant microbial contamination issues in production environments and manufactured products. With this important subject, Tim Sandle has written a freely accessible chapter for the book ‘Bacterial and Mycotic Infections in Immunocompromised Hosts: Clinical and Microbiological Aspects’ (edited by Maria Teresa Mascellino), which presents an introduction to this topic of fungal infections of the immunocompromised person. The book is published by OMICS Group eBooks. The chapter can be viewed on-line here, or as a downloadable pdf document here. The current issue of the GMP Review contains an article titled “Good Practices for Pharmaceutical Microbiology Laboratories”. The article is a critical review of the 2011 WHO document on this important subject. The article has been written by Tim Sandle. To find out more about the GMP review go to the journal’s webpage here. ISO 15189:2012 ‘Medical laboratories — Particular requirements for quality and competence’ is a new standard intended to improve the quality and reliability of medical laboratories. The standard aims to provide advice to clinicians; and cover such areas as collection, transport, reception, and examination of samples and finishing with their reporting and interpretation. ISO 15189:2012 is closely aligned to the requirements for testing and calibration laboratories ISO/IEC 17025 and the widely respected quality management standard ISO 9001. Cleaning validation is a requirement in industries such as pharmaceutical manufacturing which adhere to Good Manufacturing Practice (GMP) and Quality Systems Regulations (QSR), and is specific to the cleaning method and cleaner employed. Simply stated, validation is a documented guarantee that cleaning can be performed reliably and repeatedly to satisfy a predetermined level of cleanliness. Validation is achieved by demonstrating at least three times that the cleaning process removes residues down to acceptable levels. The above is an extract from an article on cleaning validation, published by Pharmaceutical Online. The impact of copper surfaces has been found to have a ‘halo’ effect on surrounding non-copper materials, helping to reduce the presence of bacteria in healthcare environments, new research has found. Several studies have been published during 2012 showed the efficacy of copper and copper alloys in reducing, or in some cases completely eradicating, bacteria on key touch surfaces in hospitals. Further research carried out in the neonatal intensive care unit (ICU) at Aghia Sofia Children’s Hospital in Greece shows that, as well as contamination being 90% lower on copper surfaces, they also exert a ‘halo’ effect, with non-copper surfaces up to 50cm away also exhibiting a reduction of around 70% compared to surfaces not in such close proximity. 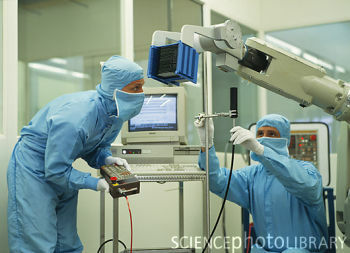 For further details, see Cleanroom Technology. Surprisingly, there are not many citizen science projects in microbiology even though microbes are of interest to the majority of the public, as well as being tractable for these kinds of studies. However, now, in relation to the popularity of this growing trend, the American Society for Microbiology (ASM) is to host a session at a conference in May. 15 17. We will highlight ALL accepted abstracts in some way both during the session and in blogs, tweets, interviews, etc. So please consider participating." 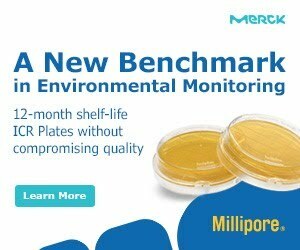 Bioburden control of nonsterile products, Microbiological Control and Monitoring of Aseptic Processing Environments. methods, Depyrogenation methods and Endotoxin Limits. A roundtable on the recent contamination related issues in sterile compounding is also on the hot topics covered. The European Medicines Agency has published a draft document titled: “EMA: Guideline - setting health based limits for risk identification in the manufacture of different medicinal products in shared facilities”. According to the guide: “When different medicinal products are produced in shared facilities, the potential for cross contamination becomes an issue for concern.” The guide attempts to set out regulatory advice in relation to this. CHMP / CVMP has published this document for comment by 30 June 2013. To read more, go to the ASM website. An antibiotic is an agent that either kills or inhibits the growth of a microorganism. 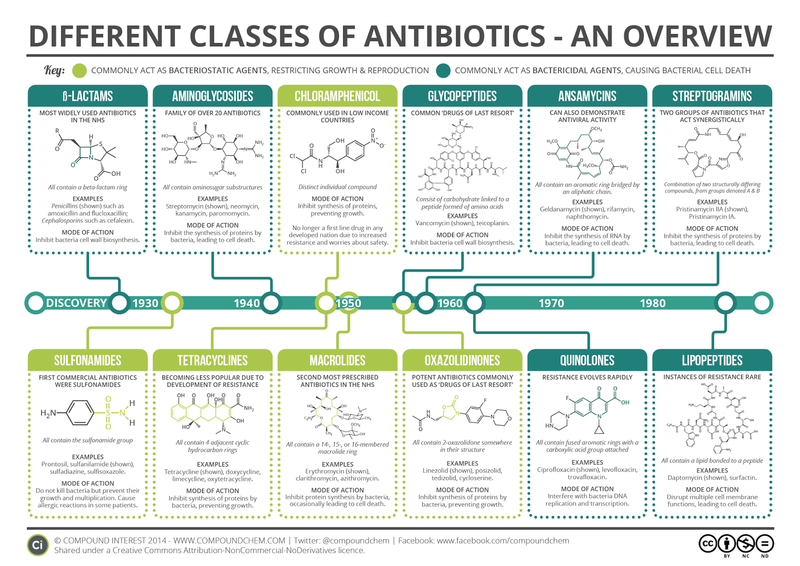 This useful infographic outlines some of the major categories of antibiotics available. bacteriostatic (with the exception of bactericidal aminoglycosides). Further categorization is based on their target specificity. 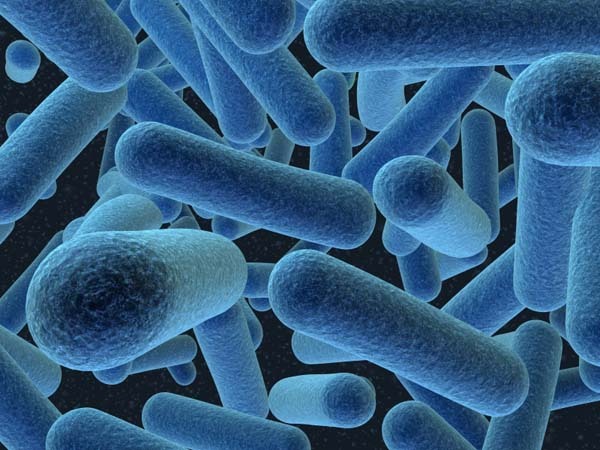 "Narrow-spectrum" antibacterial antibiotics target specific types of bacteria, such as Gram-negative or Gram-positive bacteria, whereas broad-spectrum antibiotics affect a wide range of bacteria. 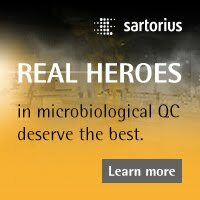 Following a 40-year hiatus in discovering new classes of antibacterial compounds, four new classes of antibacterial antibiotics have been brought into clinical use: cyclic lipopeptides (such as daptomycin), glycylcyclines (such as tigecycline), oxazolidinones (such aslinezolid), and lipiarmycins (such as fidaxomicin). Active towards relatively fewer microorganisms. Active towards Gram Positive bacteria as well as some systemic and UTI causing Gram negative bacteria. Active against Gram positive and Gram negative except Pseudomonas and Mycobacteria. General mechanism of action: Protein synthesis inhibiting antibiotics primarily target the bacterial ribosome (70S) which is made up of a small, 30S subunit and a large, 50S subunit. A ribosome is an essential, complex molecule made up of proteins and RNA and is responsible for synthesizing proteins. Aminoglycosides, macrolides, and other protein synthesis inhibitors target and prevent specific stages of protein synthesis at specific locations on 70S ribosomes. Bacterial death occurs because the cell cannot make proteins required for essential cellular processes. Effects on humans – Humans, and other eukaryotic cells synthesize proteins using a 80S (not 70S) ribosome which is not targeted by these inhibitors. (other side effects are possible). General mechanism of action: These antibiotics target different stages and pathways of nucleic acid (DNA, RNA…) synthesis. In summary, antifolates (includes sulfonamides) inhibit enzymes involved in folate/folic acid (vitamin B9) synthesis. Folate is an essential ingredient for the synthesis of pyrimidine and purines, two molecules found in nucleotides, the building blocks of DNA and other nucleic acids. Topoisomerase inhibitors prevent DNA replication by inhibiting topoisomerase activity. Toposiomerases are enzymes that relieve DNA supercoil stress during DNA replication. By inhibiting topoisomerase activity, DNA replication is greatly hindered and cell division rate is diminished. Effects on humans – Humans acquire folate from dietary sources, they do not have a synthesis pathway for folate and are not affected by antifolates in the same way bacteria are. Topoisomerases can be found in human cells; however the molecular makeup of human topoisomerases differs from those found in bacteria. (other side effects are possible). General mechanism of action: As the name implies, this group of antibiotics inhibits certain stages in bacterial cell wall synthesis. A major structural component in the bacterial cell wall (more so in Gram-positive bacteria) is an essential polymer called peptidoglycan. Beta-lactam antibiotics bind to PBPs or penicillin binding proteins which are involved in the final stages of peptidoglycan synthesis. By inhibiting PBP function, peptidoglycan cannot be properly synthesized and the cell lyses. Effects on humans – Human cells do not use nor synthesize peptidoglycan and are therefore not susceptible to beta-lactam antibiotics. (other side effects are possible). Examples: Sulfonamide, tetracycline, chloramphenicol, trimethoprim, macrolides, Lincosamide. Antibiotic resistance is a form of drug resistance whereby some (or, less commonly, all) sub-populations of a microorganism, usually a bacterial species, are able to survive after exposure to one or more antibiotics; pathogens resistant to multiple antibiotics are considered multidrug resistant(MDR) or, more colloquially, superbugs. Nowadays fewer new antibiotics are being developed, meaning we have fewer options and stronger and stronger drugs in our antibiotics armory have to be used to treat common infections once they become resistant. This means we are now facing a possible future situation where we will be without effective antibiotics. improving communication, education and training.